When you try to project the perfect image, a lot of stuff gets swept under the rug. In the case of Nancy Drew and the Hardy Boys, a lot of the dirt involves their parents. The perfect town of Bayport, where Nancy spent her childhood vacations hanging out with Frank and Joe amongst the beaches and caves of Bayport solving “mysteries,” has a lot of dirt to hide. 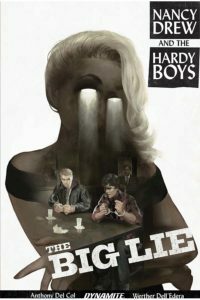 Detective Hardy was exposed as a dirty cop and killed before his trial, and the cops are trying to pin it on the boys. Meanwhile, Nancy has just found out something about her mother’s death that changes her close relationship with her father, now Federal Prosecutor Drew. Del Col takes the squeaky-clean characters of our childhood and shows us some dirt – Frank and Joe as individuals instead of carbon-copies of each other, and Nancy as a ruthless investigator. As they look further into who killed Fenton Hardy, all three teens are irrevocably changed, although thankfully not in a full CW reboot way. Del Col also throws in both sly and more overt references to other Stratemeyer Syndicate characters in very diverse ways. You get a real sense of how dangerous it is for teens to become involved in a truly adult crime situation, which is something that most teen sleuth series tend to gloss over. It was a good read that kept me engaged from cover to cover. I wasn’t quite sure who did it until late in the series, and usually I get a sense for the murderer early on, so that was a nice surprise. Dell’Edera kept the art for flashbacks bright, and the current time more shadowy, reflective of the tone of the contrast to before and after lost innocense. This is echoed by Simone’s colors using bright, warm tones for the flasbacks and pale, cool tones for the present. The two are a really harmonious pairing of art and color. As the situations become more serious, the panels seem to almost close in with shadows and a deeper palette. The over-all grittiness communicates the adult crime comic nature of the story perfectly. This isn’t necessarily a sharp turn from Anthony Del Col’s brilliant writing on Kill Shakespeare, with its own capers to solve, but definitely living squarely in this century. In the trend of updating classic characters, this version updates the Hardys and Nancy without forgetting that they’re teenagers. They still need their families, both natural and chosen, even if they’re a little smudged.